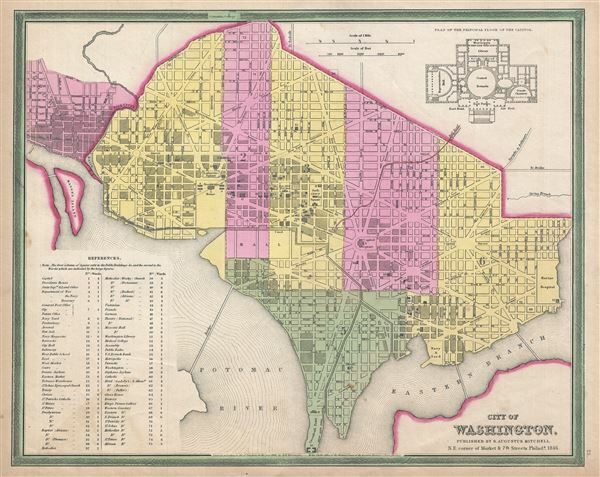 Rare first edition of Mitchell's map of Washington D.C. There is a map of Washington accurately laid down; and taking that map with him in his journeying a man may lose himself in the streets, not as one loses himself in London between Shoreditch and Russell Square, but as one does so in the deserts of the Holy Land, between Emmaus and Arimathea. In the first place there no one knows where the places are, or is sure of their existence, and then, between their presumed localities the country is wild, trackless, unbridged, uninhabited, and desolate… If you are a sportsman, you will desire to shoot snipe within site of the President's House. Nonetheless, a city was emerging, with rail lines, bridges, parks, and city wards, surveyed and laid down for the construction teams. The Capitol Building, the floor plan of which appears in the upper right quadrant, was one of the first buildings in Washington to be completed and was functional by about 1846, though, admittedly, it was a very different building than we know today. A further list of extant and proposed monuments and government buildings, along with their wards and numerical identifiers, appears in the lower left quadrant. This map was prepared by H.N. Burroughs as plate no. 16 in the 1846 edition of Mitchell's New General Atlas. Mitchell, S. A., A New Universal Atlas Containing Maps of the various Empires, Kingdoms, States and Republics Of The World. With a special map of each of the United States, Plans of Cities, (Mitchell, S. A., Philadelphia) 1846.